Located in the heart of historic Balboa Park, the Prado is a National Historic Landmark and a unique San Diego event venue. The local restaurant is owned and operated by the renowned Cohn Restaurant Group and was named “One of America’s Best Restaurants” by Gourmet Magazine. Built in 1915 for the Panama-California Exposition, which was held in Balboa Park to celebrate the opening of the Panama Canal, the Prado offers history, culture, and authentic Spanish, Moorish, and Mexican style architecture. The House of Hospitality, which houses the Prado, underwent a complete reconstruction a few years ago and every effort was made to restore the artwork, architecture, and history of the building. 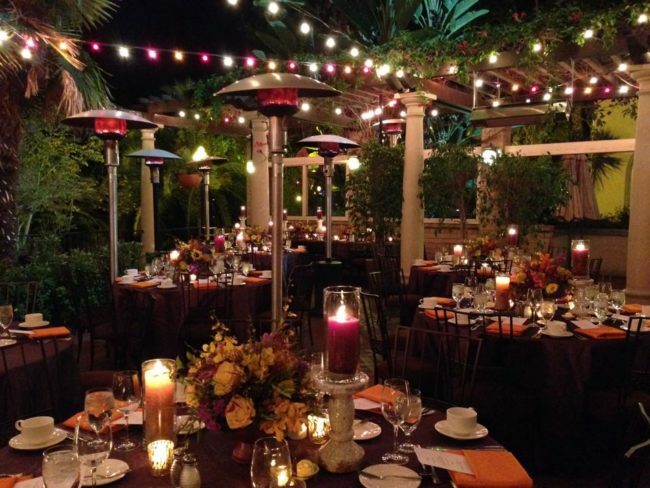 On The Scene has years of experience producing corporate events in San Diego, and we’ve produced events at The Prado, meaning we can offer our advice on which event space is best for your specific event. When you partner with OTS, we work as your behind the scenes partner, learning your company brand and goals to produce a one-of-a kind event experience. Offering over 22,000 square feet of event space, the Prado San Diego offers a unique feel, varied event spaces, and an authentic atmosphere. The event venue can accommodate groups of all sizes, from small intimate groups to large-scale events for as many as 20,000. Grand Ballroom (500 standing guests; 380 seated) – The Grand Ballroom features a 27 foot high ceiling, chandeliers, skylights, and a stage, making it perfect for elegant events. Loggia (140 standing guests; 100 seated) – Located on the second floor, this space is complete with two rooftop terraces that add to the traditional Spanish feel. Alhambra (120 standing guests; 80 seated) – Featuring french doors that open to a balcony that overlooks the Casa del Rey Moro Gardens, this beautiful space is perfect for smaller events. Fountain Courtyard (300 standing guests; 300 standing guests) – The courtyard can be used in conjunction with the Grand Ballroom and offers an outdoor setting for cocktail parties or receptions before the main event. On the Scene is an award-winning San Diego event management company. We have experience producing a wide variety of corporate events and multi-day programs for clients in a number of industries. Our experienced event managers will handle everything from the initial coordination and logistics to transportation, team dining, and entertainment. If you’re interested in hosting your next corporate event at the Prado in San Diego, contact On The Scene today!